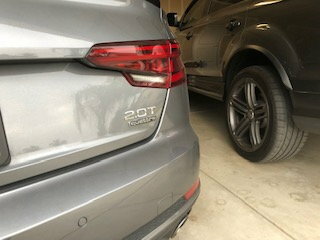 So I was thinking how hard it would be to swap the new rear valence over to the non 2019+ B9s. Parts are not that badly priced- would there be any interest? I was thinking of offering a retrofit kit if anyones interested. I was thinking about doing it to my pending Allroad to be delivered for a gloss black one with the hexagonal tips. I love the idea of a black rear valance. Not as interested in the tips, unless they are black lol. I would be interested as well. I tried to find a price for these parts but it is too early for the 2019 parts catalog to be up at the OEM sites I typically use. For reference the valance for the 2018 model is about $320 ($420 list) without any clips or screws. I would imagine the 2019 parts will be similar but I suspect that the two chrome trapezoidal pieces will be separate and will probably add another $50-$100. So figure around $500 for this cosmetic upgrade. To me this seems like a lot of cash for an upgrade that only someone familiar with Audis would notice. I have ETKA. I have all the prices for everything. The valence is definitely not that much haha. Black Optics 19" wheels, black sills, spoiler etc. Last edited by josgarc; 12-22-2018 at 03:07 PM.